Mixed Media Life facilitates both public and private art workshops. A Mixed Media Life Art Workshop is a unique way to connect with a group of people through creativity. No artistic experience is needed. All art supplies are provided. This is about the creative process, letting go and having fun! Learn various mixed media art techniques along with the opportunity to express yourself by creating your own mixed media artwork to take home. 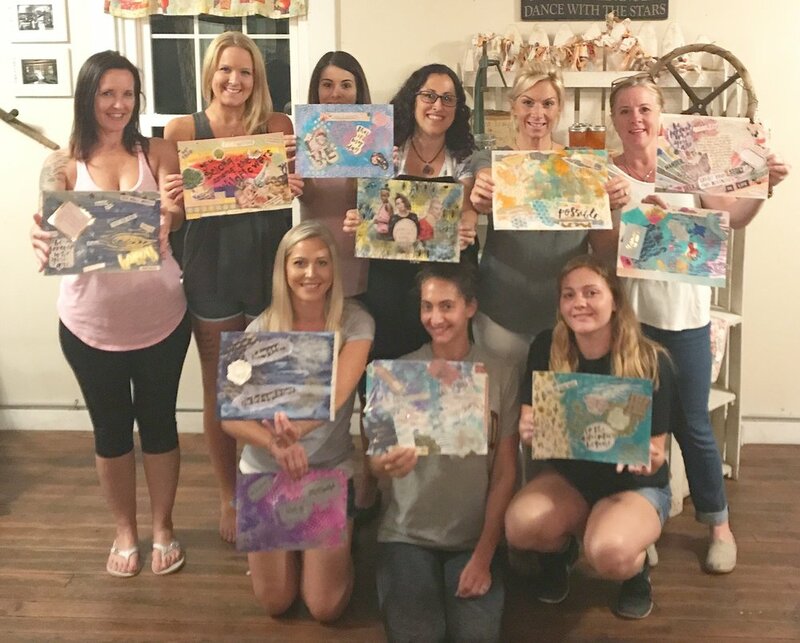 Art workshop themes include Intro to Mixed Media Art, Inner Child Art, Mixed Media Vision Boards, Artful Affirmations, Team Boarding and more. Private Workshops for Social Groups: We can customize your private event for social gatherings, girls night, retreat, birthday parties (ages 14+), bridal parties, religious groups and clubs. Planning your private art workshop is low-stress since we supply all of the art supplies. It is the perfect way to get together, have fun, create and let go. We travel to homes and venues. Contact us to learn more. Private Workshops for Businesses: Looking for a new idea for the next quarterly team building activity or after work event? An art workshop is ideal. You provide the space, tables and chairs. We bring all of the art supplies and can customize the workshop based on your needs. In addition, group or individual Coaching can be added to your workshop. There are a variety of themes available for your private workshop. To learn more, please contact us.